Street Kids Care began in 2006 with an idea to help make a difference with one young lady..
What is Street Kids Care? In 2006, a young lady named Sarah Schools-Clay was trying to rehab from a horrible ATV accident that left her paralyzed and in a wheelchair. Her sister, Stephanie, started a softball tournament to raise money for a special stem cell surgery that needed to take place in Portugal. Upon hearing about this, I spoke to my wife Courtney about seeing what we as a softball team could do to help. She urged me to get the guys together and try to raise awareness for Sarah. We went on all three local TV stations and talked about the battle that Sarah was going throuugh, and what we were doing to play our part to help raise money. JR Shapiro from our team donated a rare autographed Tim Brown Notre Dame jersey to auction off to raise money for Sarah's surgery. When it all was said in done, we helped Sarah reach her goal of raising nearly $100,000 for her surgery. At that moment, we as a team knew we had done something special. Street Kids Care was born. Unselfish softball players were now finding themselves wanting to do something more. We began getting involved in more things in the community, including taking part in our first Making Strides Against Breast Cancer Walk. That was quite a sight back then! Lots of women, some men walking with them, but no group featured a bunch of male softball players wearing our pink t-shirts and no one had a massive man named Hank sporting a pink tee and walking to raise awareness! Since 2006, Street Kids Care has donated money to several non-profits including American Cancer Society, HOPE for Animals, Corvilla, South Bend Medical Foundation, American Heart Association and St. Judes Hospital. We have helped feed the homeless in Elkhart County and walked in the downpouring rain for cancer victims. We spent hours packaging used baseball and softball items and donated them to less fortunate kids in other countries through Pitch In for Baseball. We partnered with Christian James and Helping Hits and watched him smash his way into record books by hitting thousands of softballs in just a few hours to raise money for cancer awareness. We have walked for Crohn's, and we have donated blood. We bought a young boy with cancer a brand new Playstation and 10 brand new games, and spent the day with him and his family in their home. Street Kids Care provided a large group of kids at the Boys and Girls Club some much needed recreational fun and gave away Christmas gifts afterwards. Players stood in the rain one cold day and handed out food to families on South Bends west side through Feed the Children and United Way. Players raised over 100 toys for kids through a golf outing. We have donated our Thanksgiving morning for three years to volunteer at Faith Mission. Through the kindness of one of our coaches Teddy Panagakos, we have donated hundreds of miniature stock cars to families at the holiday season. 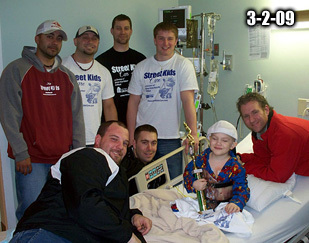 Our work with Memorial Children's Hospital's Pediatric Oncology ward has been huge, hosting the Street Kids Memorial Bowl for four years and counting. Our donations to Make a Difference Michiana through the Trivia Nights has paved the way for more companies to step up and give back even more to their organization. We have filmed public service announcements for Big Brothers Big Sisters. We have went on TV and talked about ordinary people like us to want to go out and help others, to make a difference in our community. Our Memorial Hospital Opening Night event in 2008 is still talked about by tons of people who were there that saw children battling cancer on the softball field laughing and running around with SKS players as if they were never sick. The work we have done.. the work we do.. its never been about self appreciation or making one of us feel good for doing it. Its been for two reasons: for that cause or person, and to inspire and motivate. We have used the power of videos and our website to spread the word all over to stand up and help. To make an effort to change the world. 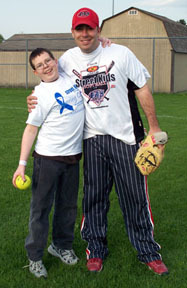 We knew we had something special with StreetKidsSoftball.com, with traffic in 2005 being about 20 visitors a day but in just one year, after launching StreetKidsCare.com, we saw the popularity jump to over 200 visitors a day. That number would eventually grow over the years and in 2012, the websites combined to have over 750,000 hits in this year alone and since the launch of StreetKidsSoftball.com in 2005, the SKS message has spread to over 2.2 million visitors. Over the years, Street Kids has participated in 47 different events to date. We have motivated hundreds if not thousands of people to make a difference, whether thats through softball or those that have followed us away from the game. In 2006, it was unheard of for amateur athletes - let alone softball players - to get seriously involved with the community as our team did and has done. No one was wearing pink jerseys for breast cancer awareness when we debuted them years ago. Today, you almost cannot go to a tournament without seeing one somewhere. That is amazing progress in our sport, to see people motivated to make a difference. When people join the Street Kids family, they understand that they are not just joining a softball team, but a group that has made it a goal to live by our creed: Street Kids Care is not just about making a difference in the community... It's about inspiring others to want to make a difference as well. One person can do anything to help another, but inspiring many to do one is even greater.